It is surprising how many features a serious tagging solution must offer, in order to be really usable over the long term. Tabbles has them all. Here are the key features that make Tabbles an all-in-one, enterprise-level tagging solution. Hover your mouse over the read moreTooltips give you more detail about a specific feature. links to have instant explanations of each feature. Many tagging tools only work with some given file type, such as music files or picture files. With Tabbles, you can tag any kind of file. It is a general-purpose tagging tool. With our Outlook plugin, you can find your emails quickly and intuitively by combining tags. You can also tag emails with the much easier to use Tabbles user interface, which supports nested tags, text completion, several sorting modes for tags, and much more. You can also synchronize Outlook categories and Tabbles tags. Tabbles is perfect for artists who produce a lot of image files, and therefore need to archive them, while still being able to find them by combining tags. Tabbles is perfectly suited for individuals and firms who produce a lot of documents, such as law firms. Here are some examples of usage: you can show all documents of a given client, regardless of the topic; you can show all documents with a given topic, regardless of the client; or you can show all documents of a given year, regardless of topic and client. Tabbles can also tag your favorite Internet URLs. This way you will be able to find old internet articles by combining tags. Other solutions (such as Firefox bookmarks) allow you to tag internet addresses, but not to combine tags to find the URL you are looking for. You don’t need to tag your files manually. You can tell Tabbles things like “when I put a file in this folder, give it this tag” or “When a filename contains these words, give it this tag”. This is useful if you have an existing folder hierarchy, or if you are naming your files in a consistent way. In these cases, you will spare the time to tag your files. Regular expressions are a powerful language which enables you to write very complex rules, such as “if the filename contains either the word Mickey OR Donald, AND the file path starts with Disney, and the file type is not “pdf”, then tag the file with tags “video” and “cartoons” “. Nesting tags means that you make a tag a child of another tag. What is this for? Suppose you have the tags “animal”, “dog” and “cat”. You recognize that all dogs are also animals, and all cats are also animals. So, when you open the tag “animal”, you also want to see files tagged with “dog” and “cat”, even though you did not explicitely tag them with “animal”, but only with “dog” or “cat”. So you need a way to tell Tabbles that any dog is also an animal, and that any cat is also an animal. And you do that by making “dog” and “cat” children of “animal”. This is the purpose of nesting tags and tag hierarchies. Another benefit of tag nesting is, of course, that it makes your tag list less cluttered, because instead of having all tags toplevel you arrange them in a tree structure. (It is however a special kind of tree, because a child can have more than one parent). When you use Tabbles, you can stop using folders altogether. This means that you can simply throw all new files together in a single folder. This might sound unbelievable to you: how can you possibly work without folders and subfolders? 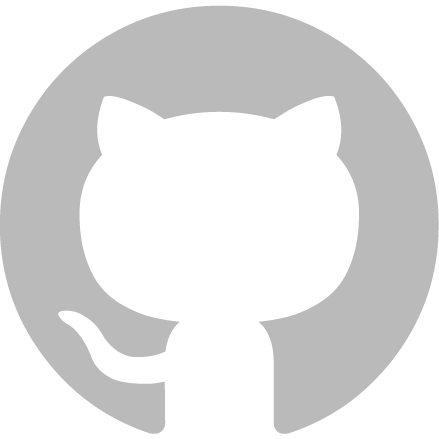 The answer is that Tabbles replaces folders and subfolders with new kinds of containers (called “tabbles”), which are similar to subfolders but are dynamically computed depending on the situation. Of course, if you have an existing folder structure and you want to keep using it, you can do so. With Tabbles, it makes no difference at all where your files are physically located. In corporate environments you often have huge network drives shared among all users. Tabbles helps organize the data present in these drives, avoiding file duplication, and allowing users to find what they need, even if they are unfamiliar with the folder structure. If you put a file in a network drive and you tag it, other users will find it, even if you don’t tell them where you put it. They don’t even need to know where the file is. When you download or create a new file, you will probably want to tag it. And to tag it, you have to right-click it in the file manager (e.g. File Explorer). But locating the file in the file manager is annoying and distracts you from your work. For this reason, when a new file is created, Tabbles displays a popup box allowing you to tag it with one click, without opening an Explorer window. This feature is called “One-click Tagging”. 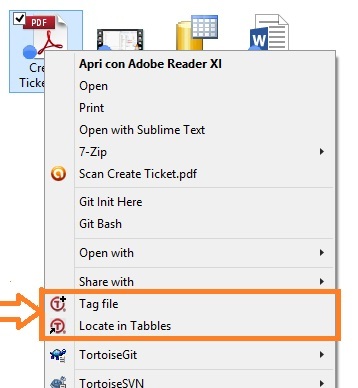 Tagging a file with Tabbles is even easier than putting a file in a folder. You can do it in multiple ways: all with mouse clicks, by drag-and-drop, or by typing the tag names with text-autocompletion. And you can sort tags in many ways, e.g. by tree or by recent usage. Very often, when you are looking for some file, just opening a tag is not enough: there will be too many files in that tag, and it won’t be easy to find what you are looking for. What you want is to combine tags, i.e. say things like “Show the files that are pictures AND are about Mary AND are not about Tom, AND were taken in the last two years, AND have good quality, AND are urgent.”. With Tabbles, you can combine concepts as much as you like, to find exactly what you need with a bunch of clicks! More examples: you can show all the documents of year 2010, regardless of the customer. Or you can show all the documents of a given customer, regardless of the topic. Or you can show all the documents of a given topic, regardless of the customer. You can intersect and subtract tags as you like, creating dynamic combinations. This feature is the main reason why Tabbles exists. Suppose you have a lot of tagged files that you seldom use — maybe related to old customers. You will want to archive them, i.e. move them to some external disk, like an USB disk or a NAS; then detach the disk, label it and put it on your shelf. Then, after months, suppose you need to open some file of an old customer. You go to Tabbles and open the tag related to the old customer; and you still find the file (even though it is on a detached disk!). Then, when you try to open the file by double-clicking, Tabbles will tell you “Please connect the disk labeled so-and-so”. You find the right disk, connect it (with whatever drive letter you want), and voilà, you can open the file. This also works for tagged files on DVDroms and network drives. This is a crucial feature for whoever produces a lot of files and needs to archive them. Some file-searching tools, or file indexers, only allow you to search in some specific file-systems, like NTFS. Others won’t search in network drives. With Tabbles, you are not tied to a specific file system or drive kind. Suppose you are collaborating with someone outside the Tabbles network. You send a tagged document to him by email; he modifies the document and sends it back to you by email (or by Dropbox, or in general from the internet). In this case, the new document that you receive will have preserved the tags of the original. i.e. you won’t have to tag it again. This is possible because Tabbles embeds the tags in the files themselves, so when they are modified and sent across the internet, tags are not lost. This feature is only available for Microsoft Office documents. For other types of documents, you can still move them with Windows File Explorer and they will not lose their tags. Suppose you are looking for a file whose physical path (disk and folder) you do not remember. Tabbles allows you to find the file through the mental path that is more congenial and natural to you. For example, “pictures → birthday → with-friends → with-good-quality → taken-in-2012”. The same file might also be found by following a different mental path, such as “pictures → with-mary → with-candles”. When you move a file with Windows File Explorer, Tabbles detects that and updates its internal database with the new path of the file. As a result, when you find the file with Tabbles, Tabbles will still be able to open it. The same happens when you rename files with Explorer. Here is a typical scenario: you find a file with Tabbles, but the file is on a detached disk. The disk once had, say, drive letter Q:, but now it is detached. You ask Tabbles to open the file, and Tabbles asks you to connect the disk. You connect the disk, but Windows gives it a different drive letter, say Y: . This causes no problem at all to Tabbles: Tabbles is still able to open the file. Tabbles does not care if disks change letters. Share tagging and collaborate with other people. Someone can tag a file on one machine, and other people on other machines will instantly see the file tagged. Support synchronization tools such as Dropbox, OneDrive, Google Drive, Copy, etc. Suppose you are using Dropbox to synchronize a folder across two PCs. So the two folders on the two PCs are exact clones of each other. In this case, when you tag a file in one folder, you want the corresponding file in the other folder to be automatically tagged as well. You don’t want to have to tag each file twice. Well, you can configure Tabbles to do just that. When you are administering a Tabbles network with many users, you want to spare your users the burden of creating tags, and putting them in a hierarchy. With Tabbles, the administrator can do all the work. He can create a hierarchy of tabbles and share it with all (or some) users. Ordinary users will see the tag hierarchy and will be able to start tagging files immediately. Due to the centralized nature of Microsoft Sql Server, any user’s tagging operation is immediately written in the central database, so other users can instantly see the update. For example, if some tags were added to a file by user A, user B will immediately see the tags below the file. With Tabbles, you search for files by opening and combining tags. Even if a file is on a disk that is currently detached (archived), Tabbles will still find that file. You are free to move files with Windows’ File Explorer: Tabbles will detect this, and update its internal database with the new path of the files. So the next time you open a tag, you will still see those files and be able to open them. We strived to make Tabbles as close as possible to Windows Explorer, so as to minimize learning time. With Tabbles you can do most of the operations you do with Windows File Explorer: copy, move, delete files and so on. Of course, you can keep using Windows File Explorer if you want, and still get the benefits of Tabbles.